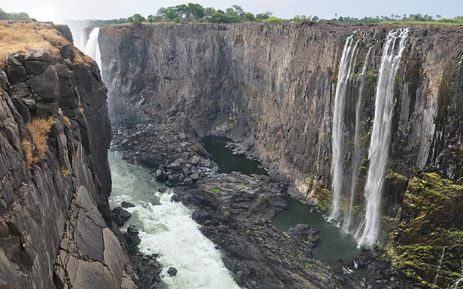 VICTORIA FALLS, ZAMBIA – Tourists staring in wonder at the full force of the Zambezi River cascading over Victoria Falls struggle to believe the region is suffering one of its worst ever droughts, but local guide Patrick Sakala knows all is not well. Flows have dropped to 30-year lows at the waterfall straddling Zambia and Zimbabwe’s shared border, as poor rains and soaring temperatures take their toll across southern Africa. “At this time of year you usually wouldn’t be able to hear me over the thunderous roar,” Sakala told Reuters, pointing at rocks piercing through a vast sheet of water dropping 100 meters, twice the height of Niagara Falls. “You wouldn’t see those rocks. You might not see anything because of the smoke all around you,” he added, referring to the clouds of mist thrown up from the swells in the chasm beneath the falls, known locally as “The Smoke That Thunders”. Downstream, Kariba Lake – the world’s largest man-made reservoir – is only 12 percent full, compared with 53 percent at the same time last year, according to the Zambezi River Authority (ZRA). Kariba is the water source for a hydro plant which provides Zimbabwe and Zambia with much of their electricity and power cuts have become a daily occurrence this year. The plant could stop producing power completely in six months if water levels continue to fall, deepening economic pain and increasing poverty, an official said last month. “It’s been terrible,” said Gloria Masheka, who runs a guest house in nearby Livingstone. Southern Africa’s drought has been blamed on a severe El Nino weather pattern unsettling climates across the world. On the continent, it is expected to hit 49 million people from Malawi to Namibia, South Africa and Botswana, leaving about 14 million going hungry, the UN World Food Program says. African governments are requesting billions of dollars in aid as the unusually dry period ruins farmland, kills cattle and cuts off water supplies. South Africa, home to Africa’s most developed economy and a key source of food for the wider region, is suffering its worst drought in a century, likely to push 50,000 people below the poverty line, the World Bank estimates. South Africa’s dams have dropped 16 percent since October and are expected to take three years to recover. The dry, hot conditions risk hurting the region’s vital tourism industry as lush safari parks are scorched brown, mighty rivers like the Zambezi are diminished and even Victoria Falls loses some of its marvel. “It’s still spectacular,” said Rory, an American tourist peering off the ‘knife-edge’ bridge which sways high above a winding river gorge under the waterfall.